As we head into our final classes of the season, it’s important to make plans to keep your skills sharp with practice! DOWNLOAD YOUR PRACTICE TRACKING SHEET HERE! Statistics show that skaters enrolled in group classes make more progress in a shorter period of time if they are skating more than once or twice a week; therefore, it’s important for beginning skaters of all ages to supplement their group lessons with independent practice sessions during a public skating session. Consistent, regular practice will help with motor skill development and will convert short-term muscle memory into automatic muscle and nerve responses that are essential to all ice skating sports. Time on the ice is also very valuable to maintain and gain skills. If you are looking for practice time over the spring/summer break – please let us know! We can provide you with some options at other area rinks that offer summer Learn-To-Skate programs. Have you filled out your March bracket yet? Challenge yourself this month with the Learn to Skate USA Bracket Challenge! Download and print your bracket here. Choose your skills and merge them to achieve a winning combination! Practice each skill three times before moving on to a new bracket. By the end of the challenge, you’ll combine your skills into a five-step series to help advance your skating to a new level! Brooklyn FSC skaters – the deadline to turn in your ice show registration forms is Friday March 1! Learn-to-Skate participants have until Friday March 22 to turn in forms. Learn-to-Skate group will be posted soon – the first practice for LTS members is Sunday March 24. Please note – forms, along with payment should be turned in at the cashier’s office (*Please ask to have your receipt stapled to your form if they don’t already do so). Have you made your 2019 skating goals yet? Use this worksheet to write them down and share with your friends and family! Share your journey on social media! We love to see how much fun you’re having on the ice! Share your skating journey this month on social media with #LearntoSkateUSA, #NationalSkatingMonth and #SkateToSuperpowers and you may even be featured on the Learn to Skate USA website! 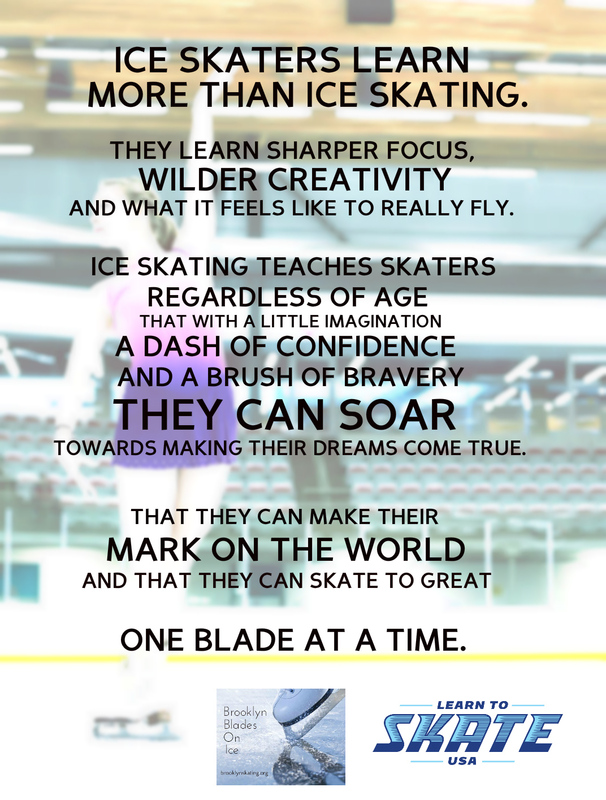 If you would like to learn more about National Skating Month and Learn to Skate USA, head to NationalSkatingMonth.com. Registration for the 2019 Ice Show is now open! We’re excited to announce that our annual ice show will be held on Friday April 26-Saturday April 27, 2019. ‘Show Stoppers’ will feature skaters from our Brooklyn Blades on Ice Learn-To-Skate, as well as skaters from the Brooklyn Figure Skating Club and special guests. ALL Brooklyn Blades on Ice LTS skaters and Brooklyn Figure Skating Club members are invited to participate! 2019 Registration Form – DUE FRIDAY MARCH 1, 2019! We’re looking forward to seeing everyone on Saturday December 22 at 7pm! Remember that the show is FREE – so please invite your family and friends! Skate With Santa on Sunday!